Republic Act (RA) No. 11213 or the Tax Amnesty Act was approved by Philippine President Rodrigo Duterte on 14 February 2019. RA No. 11213 contains provisions on Estate Tax Amnesty and Tax Amnesty on Delinquencies. In order to unburden taxpayers by forgiving past liabilities and with a view of raising revenue for the government's infrastructure and social projects, the Tax Amnesty Act was issued. The Estate Tax Amnesty covers the estate of decedents who died on or before 31 December 2017, with or without assessments duly issued therefore, whose estates have remained unpaid or have accrued as of 31 December 2017. The estate tax amnesty rate is 6% based on the decedent's total net estate at the time of death. The net estate refers to the gross estate less allowable deductions as provided in the Tax Code or the applicable state laws prevailing at the time of death of the decedent. If an estate tax return was previously filed with the BIR, the estate tax of 6% would be based on the net undeclared estate. The estate tax amnesty may be filed by the Executor, Administrator, legal heirs, transferees or beneficiaries of the Estate. Availment of the Estate Tax Amnesty within two (2) years from the effectivity of the Implementing Rules and Regulations (IRR) of the Tax Amnesty Act. It should be filed with the Revenue District Office (RDO) having jurisdiction over decedent’s last residence by filing a sworn Estate Tax Amnesty Return. For non-resident decedents, the Estate Tax Amnesty Return should generally be filed with RDO No. 39. Taxpayers who avail of the Estate Tax Amnesty will enjoy immunity from the payment of estate taxes, civil, criminal, and administrative cases and penalties. a. Fall under the jurisdiction of the Presidential Commission on Good Government (PCGG); b. Involve unexplained or unlawfully acquired wealth under the Anti-Graft and Corrupt Practices Act and Plunder Act; c. Involve violation of the Anti-Money Laundering Act; d. Involve tax evasion and other criminal offenses under Chapter II of Title X of the Tax Code; e. Involve felonies of fraud, illegal exactions and transactions, malversation of public funds and property. The TAD covers all national internal revenue taxes such as, but not limited to, income tax, withholding tax (including those withheld, but not remitted), capital gains tax, donor’s tax, VAT, other percentage taxes, excise tax and DST collected by the BIR, including VAT and excise taxes collected by the Bureau of Customs (BOC) for taxable year 2017 and prior years. The TAD may be availed of by any person, natural or juridical, within one (1) year from the effectivity of the IRR by filing with the RDO having jurisdiction over the residence or principal place of business of the taxpayer, a Sworn Tax Amnesty on Delinquencies Return accompanied by a Certification of Delinquency. The payment of the amnesty tax shall be made at the same time the return is filed. For taxpayers who avail of the TAD, the tax delinquency will be considered settled. Moreover, the taxpayers who avail of the TAD will enjoy immunity from payment of delinquency or assessment, investigations as well as appurtenant civil, criminal and administrative cases and penalties under the Tax Code and any pending cases which are all subject of the amnesty. Further, availment of the TAD will result in the termination of criminal cases with the DOJ or courts for tax evasion & other criminal offenses under Chapter II, Title X & Sec. 275 of the Tax Code and corresponding civil and administrative cases. Finally, any notices of levy, attachments, and warrants of garnishment will be lifted. Any information or data contained in, derived from or provided by a taxpayer in the Tax Amnesty Return and other appurtenant documents will be confidential and shall not be used in any investigation or prosecution before any judicial, quasi-judicial, and administrative bodies. It is expected that the IRR will be promulgated within 90 days from the Tax Amnesty Act's effectivity. The Tax Amnesty Act will take effect fifteen (15) days after its publication in the Official Gazette or at least one (1) newspaper of general circulation. We advise taxpayers to wait for the issuance of the IRR in order to determine exactly how to avail of the Estate Tax Amnesty and the TAD. 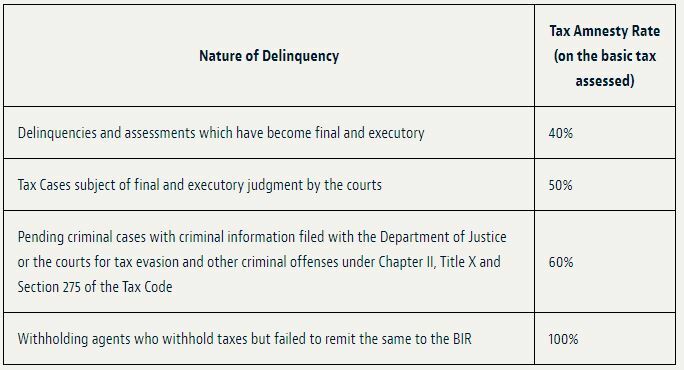 For instance, the Tax Amnesty Act does not define the term delinquencies. The IRR should iron out all the questions that taxpayers may have regarding the implementation of the Tax Amnesty Act. It should also be noted that the President vetoed the provisions on the general tax amnesty. The President asked Congress to pass another general tax amnesty bill that includes the lifting of bank secrecy for fraud cases, the inclusion of automatic exchange of information and safeguards to ensure the asset or net worth declaration are truthful. According to reports, lawmakers are determined to refile the general tax amnesty law.